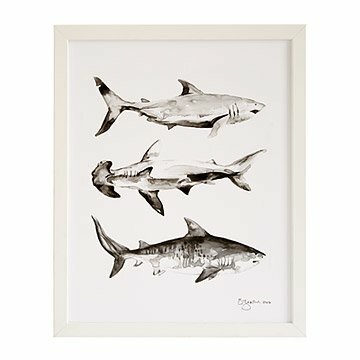 This print by Brittany Zeller-Holland captures the streamlined beauty of three iconic shark species. With a pedigree of over 400 million years, sharks are magnificent predators that dominated the seas long before Peter Benchley penned Jaws. Every week is Shark Week with this digital print of an original watercolor by Brittany Zeller-Holland featuring three iconic species: the tiger shark, hammerhead, and great white. Brittany's expressive brush brings the streamlined beauty of these creatures to life. The print makes great decor for a beach house or office, whether you're a marine biologist or a shark in a suit. Made in Michigan.